My 8th Grade World: Let's Get It Going! As many of my teacher friends are starting their first day with kiddos tomorrow...I'm rolling into Week 3 with mine and I couldn't be more excited! New desks organize great into small groups! The entire room taken from the classroom door! To the right of the classroom door, classroom library, iPad charging cube, and storage area. Classroom library, Test data tracking, and "The Fridge" were student work will be displayed! Back of the Room showing Lots of Classroom Storage! Laptop Station and Teacher Area. Not to Mention Views of my Softball Field! Along with being super proud of how our school and my classroom has come together for the first week of school...I am really excited for how my students are performing and thinking already this early into the school year! We spent several of the first days of the first week of school doing YouCubed activities that students absolutely loved! YouCubed has fabulous activities to get students thinking about Math, working collaboratively, making mistakes, and learning from those mistakes. My kiddos' favorite activity for this year came from Day 2 of YouCube's Inspirational Math. Each day there are videos to introduce both the activity idea of the day, but also to give a little background on how the activity relates to mathematical thinking. Students were asked to look at the picture and answer the following questions in their small groups: What do you notice? What do you wonder? What questions do you have? What information does this graph provide? Students were given approximately five to seven minutes to discuss in their groups before we can together as a whole class and discussed their thoughts. Hearing some of the discussions really surprised me! Students were thinking a lot deeper into this graph than I originally thought they would. 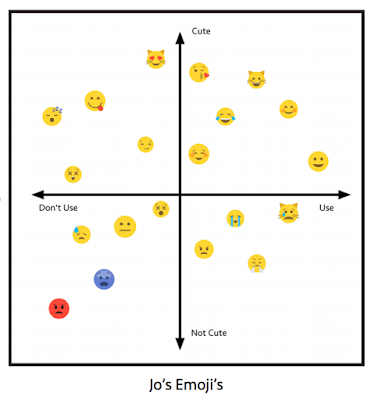 They immediately noticed that it looked like a coordinate plane and that the emojis were organized based on how much Jo uses them and how cute he think they are. 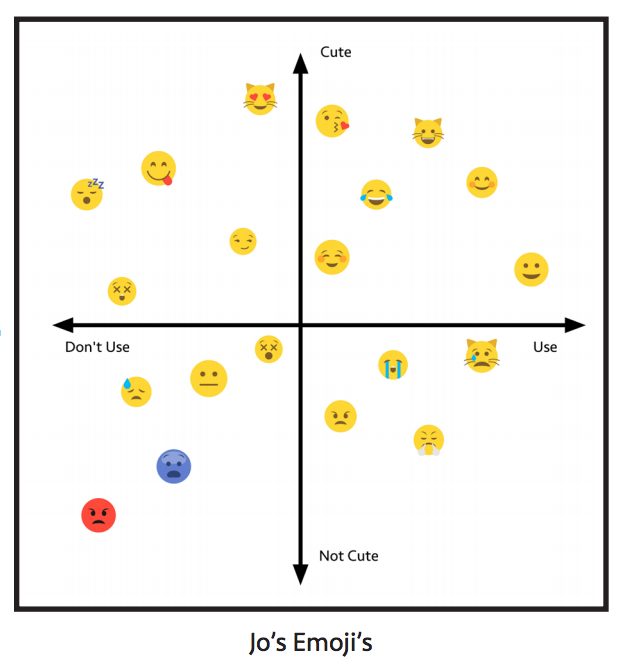 Students also began to wonder why only those emojis were used, how old was Jo, why did Jo pick those categories, among many other questions. It was awesome to hear students thinking so deeply and mathematically about a bunch of emojis but they totally ate it up and LOVED it! It's been a wonderful two weeks so far at Clover Middle School and I am super pumped to get back in the classroom tomorrow morning with my kiddos and start a wonderful week three. Bring it on!